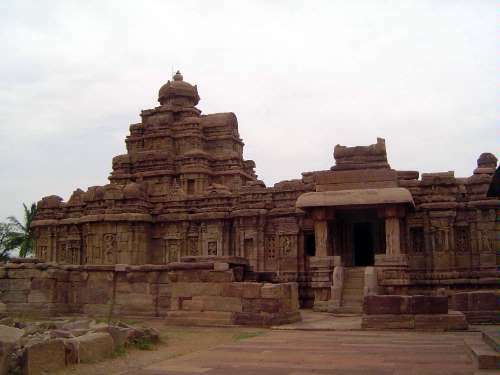 Pattadakal--the name means Red Town--is a dozen miles northeast of Badami. Until recently it was rarely visited in modern times, and the town proper is scarcely more than a hamlet. Yet this place, on the left bank of the Malaprabha River, was the place to which the Chalukyan kings came to be crowned. 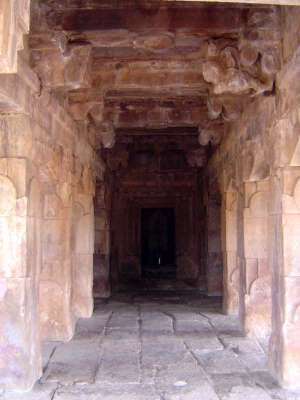 In his classic 1926 review of Chalukyan architecture, Henry Cousens wrote of this place (p. 6): "The sandstone temples erected by the early Chalukyas comprise the largest and earliest group of standing structures in south India, unrivalled for the variety and intermingling of architectural styles." Although a good road now comes by, the site still appears rustic, despite the autoricksha awaiting its bath and the mesquite, an introduced plant that has run wild. 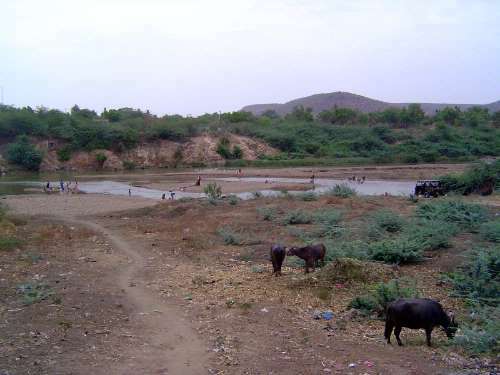 The temple cluster is approximately linear, with the river not more than a hundred yards to the left. 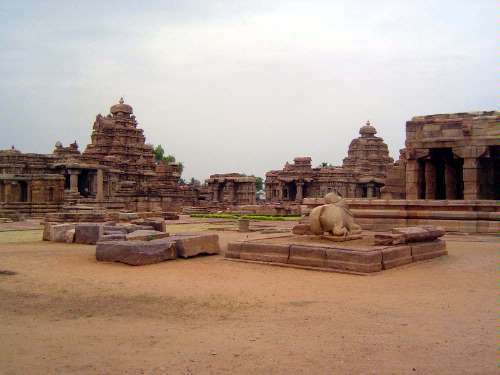 The temples in the foreground are the Galaganatha and Sangamesvara. In the distance is the Virupaksha, the biggest temple in the group. 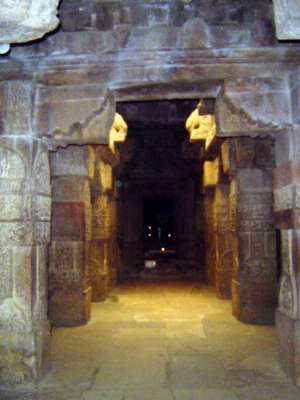 The Chalukyas had begun building temples at Badami but shifted to here. 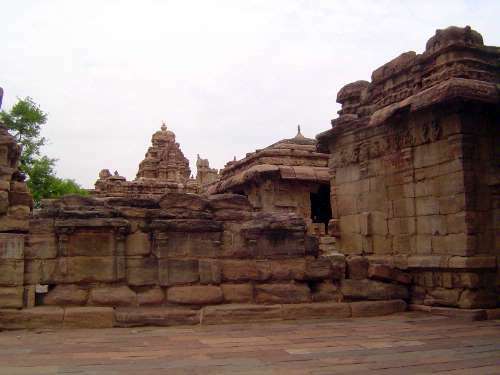 The long reign of Vijayadita (r. 696-733) saw construction of Sangamesvara, the second temple in this picture. His successor had a short but glorious reign, marked by victories over the Pallavas to the south. This king, Vikramaditya II (r. 734-45), had two queens, and to mark his triumph Queen Lokamahadevi built Virupaksha. 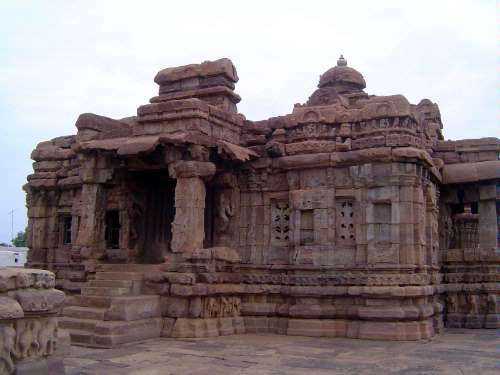 The junior wife, Trailokyaamahadevi, built the adjoining Mallikarjuna. 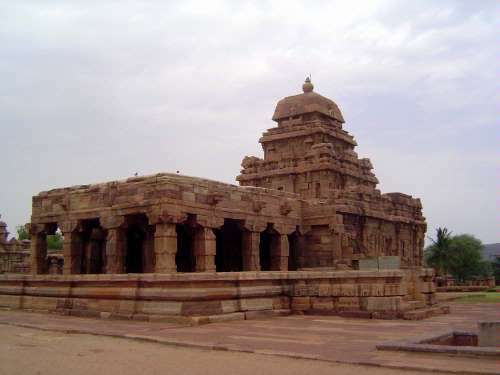 For more, see George Michell's Pattadakal, 2001. 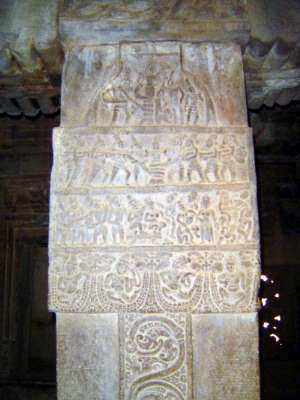 Galaganatha, though incomplete, is the earliest of the temples and has a parabolic spire probably contributed by workmen imported from Alampur, downstream from Kurnool in modern Andhra Pradesh. 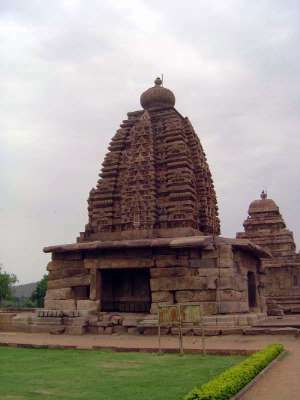 The Sangameshvara Temple, built about 720 by Vijayaditya, has a characteristically Chalukyan, square-domed kuta. The porch is a later addition. 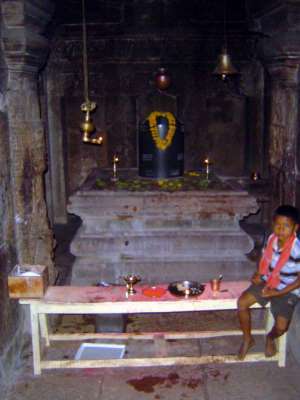 The interior is very simple, but in the dark shrine, the polished granite lingam reflects light. 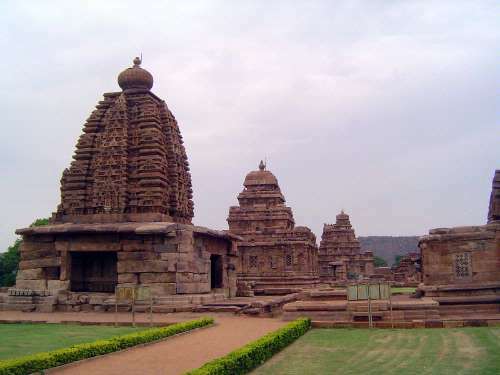 The Virupaksha Temple on the left and the Mallikarjuna on the right, both have characteristic square-topped spires. 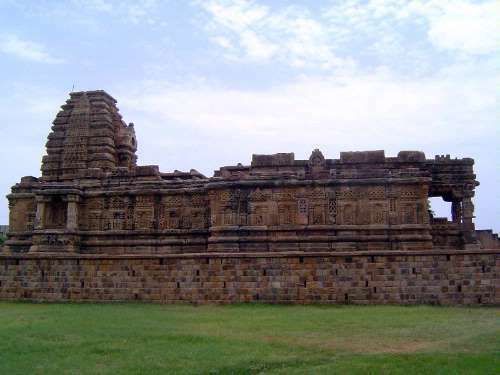 The Mallikarjuna Temple in longitudinal profile. 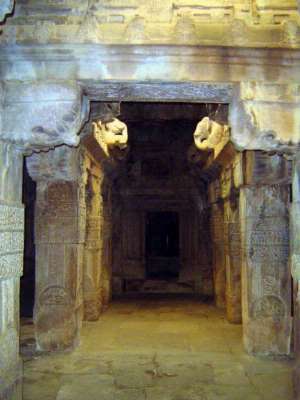 Built by Tailokyamahadevi, it was originally called the Trailokyesvara Temple. "It is an unusual thing to find the scenes of the great epics, the Ramayana and the Mahabharata, portrayed upon western temples...." So wrote Cousens (p. 63). 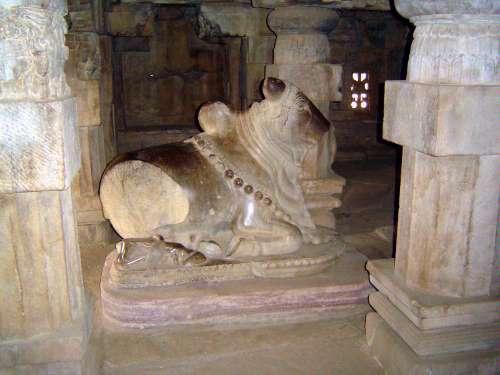 Both Mallikarjuna and its larger twin are full of allusions to those epics. 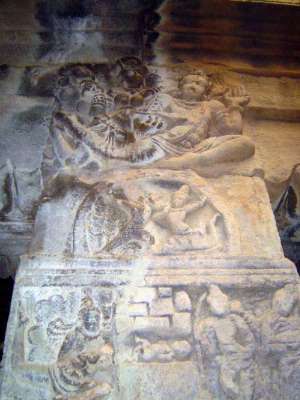 Here, the churning of the milky ocean as gods and giants pull opposite ends of the serpent Vasuki, his body coiled around the churn of Mt. Mandara. The same legend is recounted on the walls of Angkor Wat, some 1,800 miles to the east. The axis of Virupaksha extends 250 feet, ranging from the entrance to the Nandi pavilion, porch, mandapa and lingam sanctuary, all aligned from east to west. 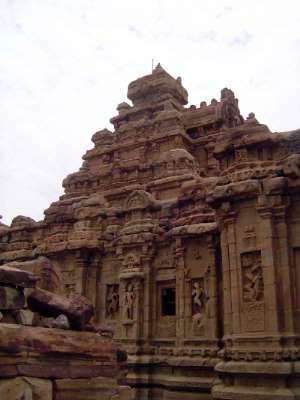 The design is so akin to the Kailasanata Temple at Kanchipuram that Cousens writes (p. 61) that "it seems likely, then, that Vikramaditya was so struck with the Kanchi temples that he induced some of the best architects of that capital to return with him." 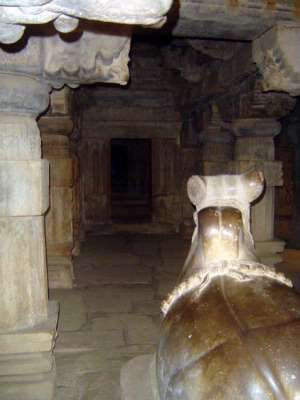 Built by Queen Lokamahadevi, it was originally called the Lokesvara Temple. A broken but still elegant Nandi. This temple is still in religious use. 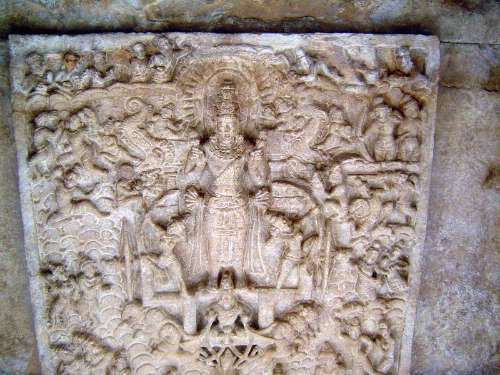 A ceiling panel shows Surya on his chariot. Still farther south, the Papanatha Temple, enlarged at the time of the construction of Virupaksha but with a spire in the northern style. Originally Vaishnava, or a Vishnu temple, it later became a Shiva temple, as indicated by the name--Papanatha being one of Shiva's names. For an unknown period but extending into the 1920s, it was used as a barn.